If there is any industry which has been affected mostly because of the pain of inventory management, then it is the Automobile industry. With the multitude of auto parts and lack of proper system to keep track of these parts have always created problems for manufacturers as well as for those looking for a reliable network. 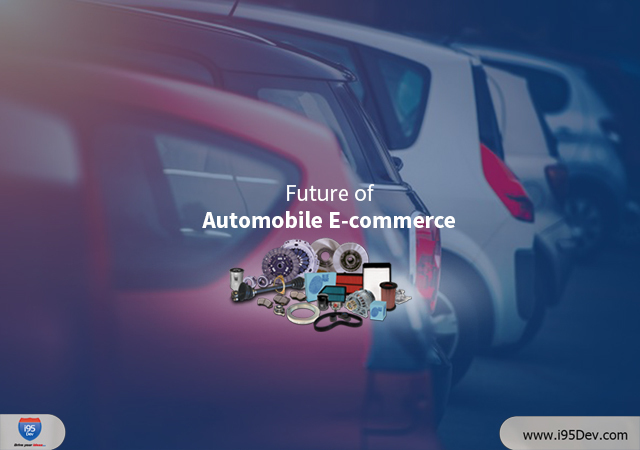 However, it’s time to celebrate as the technology has our back and Automotive e-commerce is the sparkling future which every automotive supplier should look forward to. While everything is changing with a steep pace, it is expected that the way aftermath of this industry is going to shape will also be affected immensely. The automotive landscape is now in the hands of spare parts online store which has provided both parties with a hassle-free buying and selling network. To further illustrate it with a better understanding, let us know more about the way Automobile E-commerce is going to change the aftermath of the entire game. We often predict the future of an industry depending on a lot of factors that may become the key for the change. When talking about automotive industry, we must identify those trends which are expected to make the shift in the way people are dealing for the spare parts. Taking into consideration the most important ones, there are mostly six trends that are expected to change in the coming future. Consolidation among parts distributors: The automotive parts distributors are joining hands in order to serve their customers with highest supply and diversified options. Do not even try to do the maths when it comes to count the number of parts bought and sold every day. It is impossible to channelize every demand through individual network, unless one wants to be at the back seat of the competition. Aggressive expansion of OEMs into aftermarket activities: Gone by are the days when manufacturers where not supposed to deal with the end customers. Today, everyone knows how to make the most through the online presence. The space has narrowed down. It is easy to reach customers directly more than ever. And OEMs are not agreeing to stay behind. Digitization of channels and interfaces: Thanks to the technology which has changed the way we used to trade. Not only it has made everything accessible at the tip of the finger, it has given customers options to select the best choice. Access to car-generated data: Car generated data has all the information about the vehicle and its parts. Access of this data will certainly affect the buying decision of a customer, hence changing the entire way of trade that happens between a buyer and the automotive supplier. Increasing influence of (digital) intermediaries: Digital space has given customers an open market to look for their requirements. There are huge number of players and each trying to top the favourite list of their customers. With time, this is surging and putting more pressure to the ones joining the league later. Higher price transparency and greater diversity of supply for customers: Among everything, customers have the upper hand over everything when it comes to automobile ecommerce. Being able to compare prices and look into the diverse option, one can find out the best possible deal. And, for getting that best deal, an automotive supplier needs to work out the best plan. It is a no brainer to understand that the evolving market with diversified customer expectation and technological innovation paving way for transparency and higher competition among suppliers, the aftermath of automotive trade is going to take a steep shift. The shift in the powers and the enhanced reasoning for calculating the value of automotive industry would make a huge impact on the industry. Most of the automotive suppliers are already stammering to find a way through the challenges and failing to pace up with time can even throw them out of the competition forever. What would be the Growth of Automobile E-commerce through 2030? To understand what this industry lay for the automobile suppliers in 2030, here is a forecast which predicts the future of the industry by 2015. According to the prediction, the demand is expected to go grow above 1 billion by 2025 since 2017. In 2017, the size of the automobile e-commerce aftermath was over USD 8 billion. Now, you can guess what it is going to be like in 2030. This certainly is good news for those who are ready to change their business model as per the expected change in the technology. According to the US Ecommerce aftermath data, the rise in the demand is going to change the way suppliers interact with the market as well as intermediaries. Below is the graph to show how the trend is going to rise by 2025. This comparative graph very well depicts the difference in the demand volume by various sectors of the market, either its B2C, B to Big B, B to Small B. The increase is in million units. Isn’t this fascinating? It is believed that the surge in the number of aging vehicles will give way to the increased demand for various auto parts. Due to excessive wear and tear, the opportunity for automotive suppliers and other participants is expected to rise many folds. Either its electronics, car care tools or the interior accessories, everything will be asked for in greater volume. What are the Challenges Faced by Automobile Industry? Having to shuffle between so many jobs while making the spare parts available to your customers and clients can put you through a lot of stress. Can you imagine yourself keeping a track of every log book for in and out of the spare parts and the entries from the dealers? You will find yourself scuffing in the middle for nothing. The teams within an automotive industry are not only required to perfect one’s own department of responsibility but should have great coordination within departments too. When the internal team wants to restock the parts that are out of stock or the marketing team needs the details of the available parts, the communication needs to be precise and prompt. Think about an example where a glitch in the inventory management leads to overstock. You must know where it would lead to. Less demand and high supply only lead to the overstocked parts losing its value. And, no business owner would like that. The good news is that this error can be easily handled by the Automobile e-commerce which not only keeps data in sync but does the work in fastest possible time without much of human intervention. How an Effective Interactive Spare Parts Catalogue is the key to Success? Technology has given us many surprises to ease our lifestyle as well as the way we handle our work and personal life. It has plummeted the turnaround time and minimizing the human error to huge difference. The same technology is here to help us through Interactive Spare Parts Catalogue to increase the efficiency of Automotive industry by many folds. i95Dev, being known as Market leaders of Magneto Dynamics integrators is transforming the automobile inventory management system to a whole new platform which is way more responsive and hassle free. Our high-quality product catalogue management has provided many automobile e-businesses a platform to grow and scale by shifting them on Magento e-commerce platforms through integration of their complete ERP with not much hassle. You can enjoy the perks of being on the spare parts online store and build your brand through upsell and aftersales services. All you need to do is derive the benefit of the technology by integrating your existing ERP on the Magento E-commerce platform for good. Here are few major benefits of the Automobile E-commerce Platform that i95Dev has designed for its clients. Creating of Catalogue: With this feature, you will own the entire process of your business. No need to ask for anyone’s assistance as everything is possible with the click of the mouse. From catalogue creation, catalogue maintenance, import of data with various formats, catalogue updation to entire process automation, you are the boss. Single Source of Publication: The independent data retention lets you enjoy the one source publication. Just one click and the data would be updated everywhere. Identification of Spare Parts: This feature gives you access to all the data in just few seconds. All you need to do is search for the specific part and all the details will be at your finger tip. E-Ordering of Spare Parts: Optimized order processing through electronic media to provide hassle free order without any transmission error. The penetration of e-commerce into automobile industry is indispensable and it is expected that the online buyers will rise enormously in coming years. In 2018, where the online orders were restricted to just 14%, it is expected that the spare parts online store demand will surge to 25% in next three to five years. Why not take examples of companies that are already leading the industry? RTW Wheels which is a wheel and tire company in Texas, shifted to Magento Ecommerce and allowed the customers to order the parts at wholesale price. This OEM made a huge difference to its sales and customer acquisition by making one simple decision of shifting their business model to the automobile e-commerce platform. There are many such example who followed the same pattern. So, why cannot you. The world is shifting to access the global market through digitization. As the technology penetrates the automobile industry deeply, customers have started expecting transparency in prices and business models. Through automobile e-commerce and availability of spare parts online store, even the OEMs are joining the race. So, to expect the best in terms of price and service is what customers will be looking forward to in the coming years. Definitely, the demand will increase, but the expectation would increase even further. And, to exist in that arrangement, an automobile supplier must follow the rules that the technology has set forth for them. Or, else, it would become difficult to survive in such competitive world. Either one chooses to remain in the game by choosing the automobile e-commerce platform or the game is over. If you wish to be one of the leaders of automobile industry in the coming future, know what else i95Dev can do for you. Contact us to know more about our company and how it can help you implement Automobile e-commerce requirements.